Gratnell Q2 trays will fit these units. 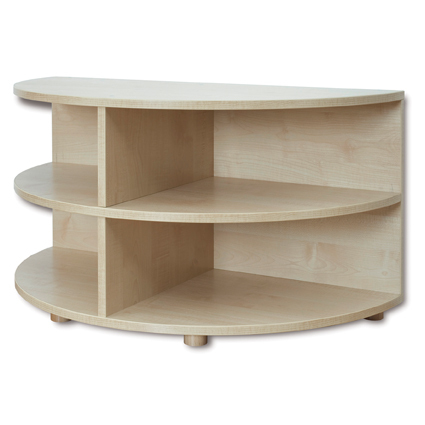 This modern Reading Nook Rounded End Storage Unit is a key part of the Reading Nook Set or can be used as a stand alone unit. A great place for storage, the unit is compatible with Gratnell Q2 trays. Unique and versatile, the unit can be moved about, enabling you to combine several units together to create one exclusive unit to best suit the space. Manufactured from 18mm Melamine faced Maple Particle Board. Each unit has 30mm wooden feet. PVC and foam seating supplied with units – safe and easily wiped clean. Units can be used alone or as part of a set (unit heights include 30mm for wood feet).